Dear American Airlines is one of those rare novels on which we can unabashedly lavish endless praise and hail it as an unputdownable tour de force! In just 180 pages, Jonathan Miles pens a brilliant tragicomedy the likes of which you’ll probably never encounter again. So what is Dear American Airlines about? Ha ha ha. Not an easy question to answer, kiddo. The book is many things. A lengthy profane hilarious rant punctuated with many tragic moments, an autobiography, and a wild ride metaphorically and occasionally literally (New Mexico trip for instance). Dripping comic acid as every page does, the book is also a touching emotional account of the life of our middle-aged protagonist Benjamin R.Ford, self-destructive poet, graduate school dropout, son of a Holocaust survivor father and a schizophrenic mother, bartender, writer, alcoholic, absentee father and lately a Polish translator. Benjamin or Bennie, goes through life in an alcoholic haze, a lot of it in God’s phantasmagorical creation, New Orleans. But Dear American Airlines is more than just about Bennie. There’s a motley cast around him including the Polish father, the bipolar mother, the various oddballs in the bar etc who are as interesting as Bennie. I could tell you more but I’d be depriving you of the thrill of reading this magnum op. Title notwithstanding, the book has almost nothing to do with American Airlines. The cancellation of an American Airlines flight to Los Angeles provides the scaffolding on which Jonathan Miles builds a beautiful novel whose every page is a treat. No book should be this good because it sets the bar impossibly high for all the other writers that follow. 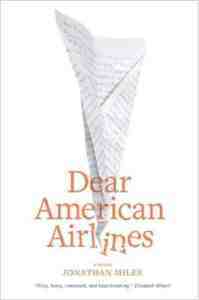 Dear American Airlines is available at every U.S. library. I swear on Lord Balaji of the Seven Hills that after reading it you’ll want to bestow endless sloppy kisses on yours truly for the recommendation! One Response to "Dear American Airlines Review – No Book Should be This Good"
There is a ‘Benjamin Ford’ in all of us. More so when we are stranded in an airport twiddling our thumbs and reflecting on our past deeds. I was planning to write a longer review, but the sudden passing away of Robin Williams has stunned me and I really don’t know what to say. For those of us who were in India at that time, there would have been no Avvai Shanmughi without Mrs. Doubtfire. Despite the Tamil movie being a hit, Kamal did a poor imitation of Robin Williams. RIP. 1. You write: There is a ‘Benjamin Ford’ in all of us. Dear American Airlines is a more powerful book than Want Not considering the former is smaller by at least 200 pages. 2. You write: I was planning to write a longer review, but the sudden passing away of Robin Williams has stunned me and I really don’t know what to say.